Worlds Day Four - The three not the 300! Looking at it, and knowing this is about sailing, you might expect that headline to be some reference to huge wind shifts. It is not. Mind you, out on the track today for the 2018 Etchells World Championship, we did see everything from 110 early on, to 050/060 degrees, with the latter being where it would settle in and allow two more races to be conducted. This brings the tally to six so far, which is a series, so well done to the entire Race Management team under the peerless Wilson Brothers. One more race and the drop comes into play, which will make many of the crews happy, especially those already pinged under Code Flag U over the last couple of days or the dreaded Black that made its first appearance yesterday. So you would think that everybody would be playing nicely today, but alas there was more punishment to be handed out, with half a dozen receiving a soft rap over the knuckles and having an early lunch break as they watched, not partook, in race five. When Race Six finally got underway, with the Black Flag out once more, just the one crew had an early visit to the bar at the Royal Queensland Yacht Squadron mandated upon them. Doh. So back to the headline, and this type of sailing is a sport where the lowest points matter, not the highest. Now this is where the line, three, not 300 really counts. Technically, there are still three races to be run. Two tomorrow, and then one more on Saturday. You win those three, and you collect three points. Get taken off the course, or sail well deep into the field, and you march towards 300 pretty smartly (and slide down the ladder even faster). Friday’s weather is also set to play its part, too. It is going to be hot. 35°C warm, actually, and there is 15 knots on offer, with 25-30 later in the day, and the chance of a thunderstorm too. Indeed one of those rolled through just as the world famous David and Sue Healey BBQ was underway. It did not have a lot of venom in it, but the light show was pretty cool. 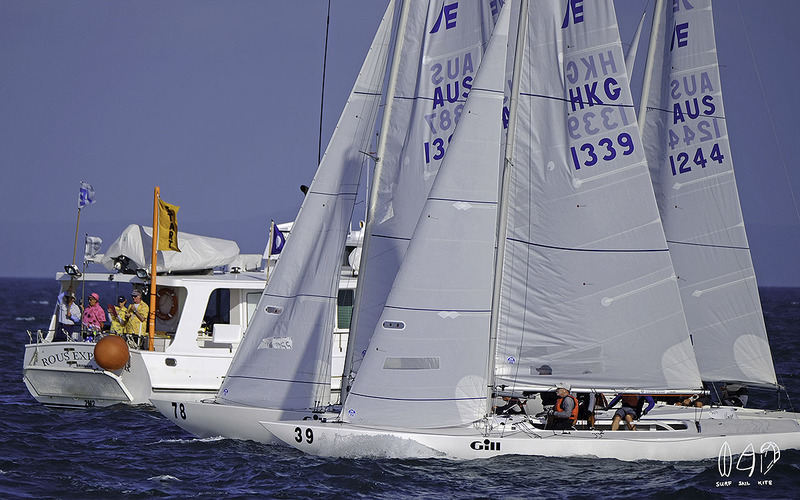 Matt Chew won the 2009 Etchells World Championship that was staged out of the Royal Brighton Yacht Club in Victoria. He was part of Jason Muir’s crew then. These days he skippers Gen XY, with Brian Donovan, Ash Deeks, and Ben Vercoe as crew, and today they won Race Five. 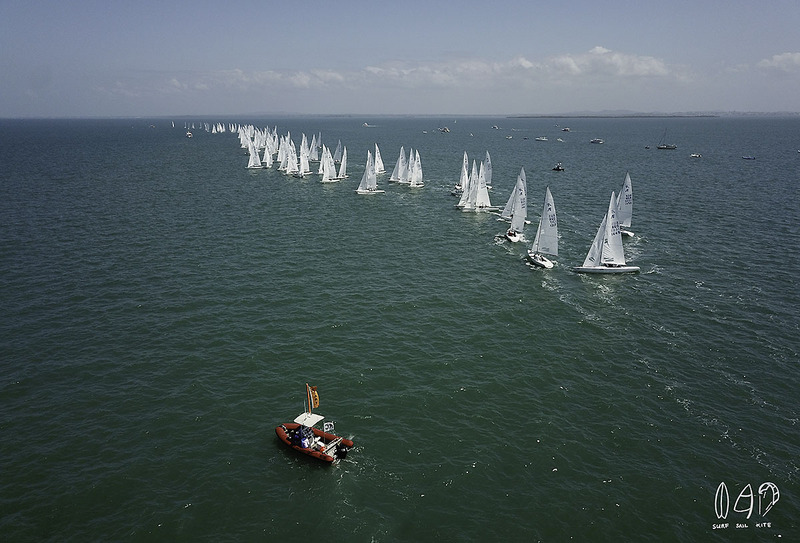 They then backed it up with third place in Race Six to stand seven points clear on the overall tally from Racer C out of Hong Kong (Mark Thornburrow, Mike Huang, Alexander Conway, and 470 superstar, Will Ryan - some 13 points ahead of his 470 skipper, Mat Belcher on Lisa Rose). Lawrie Smith, Richard Parslow, Goncalo Ribeiro, and Pedro Andrade on Alfie (GBR 1434), won Race Six today. They were part of a day when the Internationals did really well, and regularly occupied top ten spots during all the mark roundings. Others included Skanky Gene (USA 1464), America’s Jud Smith driving Roulette, and then USA 926, Oatmeal, which is Peter Duncan, Andrew Palfrey, Victor Diaz de Leon, and Sasha Ryan. “We thought when we came here it was going to be big breezes, but it has not been as much as a lot of people probably thought. One day in the pre-worlds was certainly too much. Certainly getting to know the tides has been a big part of it all. I think we may really only be getting to grips with it now. If we could have done a few more regattas here, then it would have helped. Of course, having to do penalty turns is never going to help either, and we did have to do that on one of the earlier days. All in all, it is nice to win a race. Get a bad start and it is hard to get in the top 20, let alone the top 10, so we’ll just have to see. It is a very tough fleet and there are no slow boats. You just have to stay right on it.”, said Smith in closing. Racing continues tomorrow, Friday October 26, where it is hoped that two additional races will be completed. In the process, not only will the overall result become clearer, but also that for the other divisions, namely Masters, Grand Masters, Female Helm, Youth and Corinthian, with the latter all having amateur status. Pretty sure the Committee Boat knows who you are. They sure did under Code Flag U and B today!